Plot: An IRS agent with a fateful secret embarks on an extraordinary journey of redemption by forever changing the lives of seven strangers. I’m gonna let the cat out of the bag on this right now; this movie is fantastic and I strongly recommend you watch it, unless you’re only into action movies and such. Seven Pounds is a movie up along side, or even better, than Pass It On (Kevin Spacey, Helen Hunt) and almost – in my eyes and in this genre of movies – as good as The Shawshank Redemption (number #1 on the Top 250 IMDb list of all time). Seven Pounds really touched me like only very few other movies ever did, including the two above mentioned movies. Will Smith is always a great actor and he does really well in this movie. 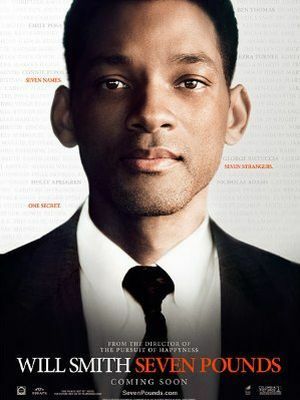 I think I can safely say, without too many spoilers, that Will Smiths character carries a great secret in Seven Pounds and he is looking for seven people for which he can greatly improve their lifes. And it’s not just a matter of giving them money, it’s far more than that. This is one of those movies that makes you – or me, at least – think about life and appreciate it just a little bit more. In general, I try to be as helpful and friendly towards others as I possibly can, but I’m also always keeping my guard up, because there’s so many people out there just trying to take advantage of you. What Will Smiths character did in this movie was really something! I actually thought this movie was from 2009 as it said so on Apple TV where I rented it, but according to the Internet Movie Database, it’s from 2008 – maybe it was made in 2008 but released for rental/DVD in 2009. .-= Shadow@Compute Live´s last blog ..Google Chrome 4 Coming Soon =-. Exactly! I was completely lost in the beginning too, what was going on etc… but throughout the movie it starts to make sense and it all comes together very nice, in the end. I liked this movie too. It had me thinking a lot after seeing it. I thought it was not going to be a good movie, because lots of people did not like Will Smiths acting in it so I almost did not go to see it, but still ended up watching the movie. .-= jason´s last blog ..I hate being addicted to BlackBerry… =-. I would probably not place it in the top of my favourite movies but I did enjoy the story. Sitting here in front of my computer and thinking through the whole movie to find something specific I liked about it but it was simply so overwhelming. Great movie, basically. .-= Stefan´s last blog ..How to Get Free Content From Experts =-. I’ve seen Seven Pounds think few months ago. Very impressed. However, I do like Pursuit of Happiness better. ^^ No matter what, Will Smith is a talented actor. He sure knows how to pick the scripts and totally make them believable. I thought this movie was prety well done, but a bit on the sappy side 😉 I think it stacks up pretty well against the rest of Will Smith’s filmography though. Pursuit of Happyness was probably my favorite of his more serious films, and I Am Legend was really good, but it would have been soooo much better if the Zombies weren’t so obviously computer generated. Good Film, Makes me wonder if IRS agents are really that intrusive, im sure they are. Great acting, well, Will Smith is an A Lister and probably will always be, Love his sons early start in film, Jayden Smith is so cool in the new Karate Kid. I love movies so much, backlot7 designs and manufactures screen useable props for movies, so when i find interesting blogs and sites like this I have to comment.Thank you techpatio.com good reads. William G.
I loved this movie and Will Smith was magnificent. Who would have imagined a man would go that far into sacrifice? What I also liked a lot were the subtle intentions of sacrifice, that were hard to guess -> awesome movie directing.